He went to sea at the age of twelve, and rose to become Admiral, Viscount, and a National Hero (and also a National Scandal for his devotion to Lady Hamilton). His many battle honours include the Battle of the Nile, Cape St. Vincent, and Copenhagen. He died in October 1805 on The Victory at the Battle of Trafalgar, and was given a State Funeral amidst unprecedented scenes of public mourning. 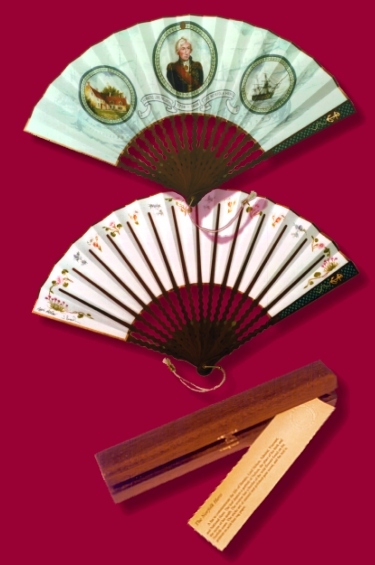 Our first, and only production - The Nelson Fan - an edition limited to 100 fans, supplied boxed. The fan leaf, printed on an acid-free rag paper, depicts a portrait of Nelson, his birthplace, the Parsonage House at Burnham Thorpe, and The Victory, the scene of his death. These are set against a background of ships of the period. The reverse has a border of wild flowers of the North Norfolk coast. All the illustrations are taken from original paintings created for this fan by Pippa Brooker. The sticks are of pear wood, mahogany stained, in English serpentine style, and the guard sticks have a fish scale design with an anchor and rope, set on a rippled foil. The fan is finished with a miniature rope cord through a brass bead and "bollard", and the whole is housed in a mahogany "sea chest" with brass fittings. This edition is now closed, and no longer available, the details left here for illustration only.